Bubba Hickory Wood Flooring is a super durable floor for all types of spaces. 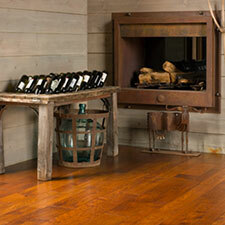 Hickory Bubba Wood Flooring is made with a super tough Valspar Alminum Oxide Finish. This finish is coated 8 times to each piece of wood. The Valspar Wood Finish helps to protect the woods surface from scratches and scuffs. Bubba Hickory Hardwood Flooring is available in 3 beautiful collections to choose from. Bubba Distressed Hickory Wood Flooring is a beautiful wood floor that shows many types of character markings on the surface of the wood. Distressed Hickory is lightly wire brushed in order to create a slightly textured surface, while maintaining the natural beauty marks found in the wood. This collection is the most natural looking of the 3. 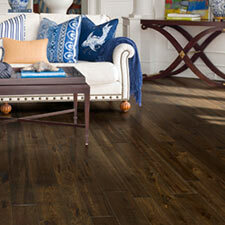 Bubba Hickory Series Wood Flooring is a beautiful collection of hand carved planks. This engineered wood flooring collection is made from the finest hickory wood available. The Hickory Series comes in 5 in wide planks. 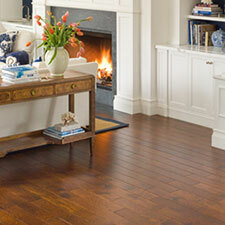 Bubba Hickory Series will add a welcoming feel to any home or office. Bubba Reserve Wood Flooring features 4 beautiful, hand scraped hickory wood products. This collection comes in random width planks, 4 in, 6 in, and 8 in. These wide width planks are made to last and will add unique look to any home or office.